Many of the boxes contained large multi-volume sets on the history of Japanese film. I haven’t written blog posts lately because I have been spending most of my time trying to determine what archival materials are left in the Collection and in which boxes they may be found. I will post an update about that in the near future. At least for now, enjoy these photos. This entry was posted in Uncategorized on April 17, 2013 by Beth Katzoff. 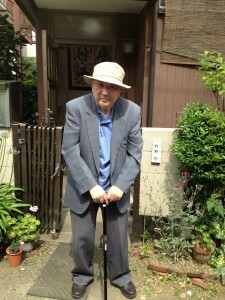 This June, I visited with Mr. and Mrs. Makino and scholar Mr. Satoh Yoh at the Makino home in Tokyo. While they showed me some albums containing photographs of individual books taken before the Makino Collection was packed up and sent to our off-site facility in New Jersey, we discussed some of Mr. Makino’s interests in cinema, and his ultimate hopes for the use of the collection at Columbia. He described some of the work that went into packing the collection over the course of three months with the assistance of Mr. Satoh. Despite the move of the massive Makino Collection to Columbia, Mr. Makino’s study still contains books and videos that he kept for his private use. These include scenarios that he wrote for documentary films. Mr. Makino continues to collect film-related scholarship. We spoke of Mr. Makino’s acquisition of novelist and playwright Kume Masao’s/久米正雄 materials. Kume was a novelist and classmate of authors Akutagawa Ryunosuke/芥川龍之介 and Kikuchi Kan/菊池寛. 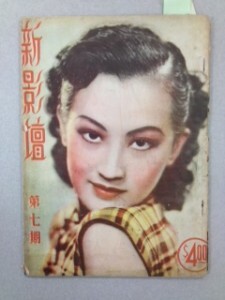 Kume wrote interesting pieces on film and was a consultant for such film production companies as Shōchiku, Tōhō, and Nikkatsu. The Kume materials in the collection include invitations (some postcards) from studios to studio events. We also spoke of screenwriters Ikeda Tadao/池田忠雄 and Inoue Kintarō/井上金太郎, who are both not very well known in Japan, but who Mr. Makino considers important figures in film history. The Makino Collection contains many scenarios formerly owned and written by both men. There are almost all of Inoue’s scenarios (over 100), and a few that were originally owned by Inoue but written by the great directors Ozu Yasujirō/小津安二 and Yamanaka Sadao/山中貞雄. According to Mr. Makino, Inoue recognized the importance of Ozu and Yamanaka early on. (All of these scenarios have been processed and can be requested at Starr Library during Rare Book Hours. For a complete list of scenarios in the Makino Collection, click on “Scenarios, alphabetical listing by title” on the Makino website). Mr. Makino told me that before he attended college, he wrote poetry and that this is where his interest in cinepoem or eigashi/映画詩 originated. Cinepoems are poems written in the style of a film scenario. They may have themes, stories, or characters that come from film. (I would like to thank Professor Will Gardner at Swarthmore College for his explanation of cinepoem). The Makino Collection contains Mr. Makino’s drafts for his presentation on 1910s and 1930s cinepoems and its related short piece in the Japan Society of Image Arts & Sciences/Nihon Eizō Gakkai/日本映像学会 (1993), where Mr. Makino writes about the influence of avant-garde French surrealist poets (and their cinépoème) on Japanese poets and filmmakers of the 1930s. The connections between poetry and cinema (and literature more broadly) share a long history. 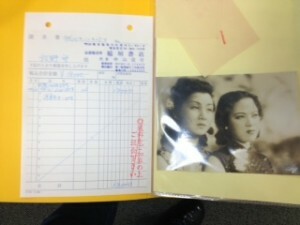 This is evident from the vast assortment of prewar journals in the Makino Collection that touch upon poetry and cinema. Mr. Makino told me that Director Yamanaka Sadao once said he wanted to make a film that was like a haiku and that many prewar directors were concerned with the visual expression of poetry. Although Mr. Makino hasn’t written much on this topic himself, he expressed his hope that new theories might emerge from those who use his collection hereafter. Since many of my questions concerned processing the Makino Collection, we also talked about some special materials, including the 23 Eiga zuihitsu/映画随筆 journals, housed with coterie magazines or dōjinshi/同人誌 (Series 6 Subseries 20, University Files and Coterie Magazines). These date from July 1925 to July 1929 and were self-published by student clubs dedicated to film, in this case at Kyoto University. Non-commercial and ephemera, these publications are not available in Japan. (See my previous blog posting on coterie magazines for more information). Mr. Makino also mentioned Eiga kagaku kenkyū/映画科學硏究, a journal started by Director Murata Minoru/村田實 with Ushihara Kiyohiko/牛原虚彦 in 1928. The Makino Collection has all 10 issues published between 1928 and 1932. (All 10 issues may only be available at NDL and at Tokyo University in Japan, but only a few of the original issues may be held at other libraries in North America). Most of the Makino issues are signed and dated by Nagashima Eijirō/永島映次郎 but vol. 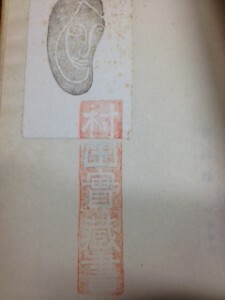 8 has a stamp from the library of Murata Minoru/村田實 himself (see the image below). These are just a few of the many film topics we talked about. While in Kyoto, I also gave a presentation at Ritsumeikan University (June 25, 2012) entitled “An Introduction to the Makino Mamoru Collection at Columbia University’s C.V. Starr East Asian Library.” Here is the Powerpoint (Intro to Makino Collection – June 2012 – 6-4) with topics covered (in Japanese) and the poster can be found at: http://www.ritsumei.ac.jp/file.jsp?id=61839. Atsuko Oya-san was the commentator. The idea was to inform graduate students at Ritsumeikan about not only the treasures to be found in the Makino Collection and the current status of processing, but to emphasize the global nature of scholarly research in Japanese film studies. It is my hope that such students and scholars will visit the Makino Collection in New York City as part of their scholarly research and that their use of the Makino Collection will inspire the new theories on film studies that Mr. Makino desires. This entry was posted in Uncategorized and tagged cinepoems, coterie magazines, Ikeda Tadao, Inoue Kintaro, Kume Masao, scenarios, The Museum of Kyoto, The National Film Center on September 14, 2012 by Beth Katzoff. For those interested in the Makino Collection, you may want to attend the upcoming daylong symposium on The Conant Collection that will be held here at Columbia University, "The Korean War and its Aftermath: Cinematic Memories from the Theodore Conant Collection"
For more information, check the Conant Collection Symposium website. This entry was posted in Uncategorized on March 21, 2012 by Beth Katzoff.